“What was that—” Han yelled, and then a blaster shot shrieked through the air from the doorway. Another shot fizzed and then thunked against the bar right by Han’s head. “Coming!” he yelled, hopping up and dashing for the back exit behind Sana. “Who did you piss off now?” he demanded as they broke out into the thick Takodanan night. “I told you it was mean bounty hunters,” Sana said. The creature raised his mortar launcher and then something huge clobbered him from behind. Frapsen. All six of the Fromprath’s arms ensnarled the bounty hunter as the two tumbled forward in a clutter of curses and howls. Three more figures tumbled out of Maz’s place, blasters blazing. They bolted down a quiet side street, cut a hard left, and crossed the main square toward the starship bay. The whole world had snapped perfectly into focus as soon as those blaster shots rang out, and now the hours leading up to it just seemed like a painful haze. “The Falcon ready?” Sana asked. 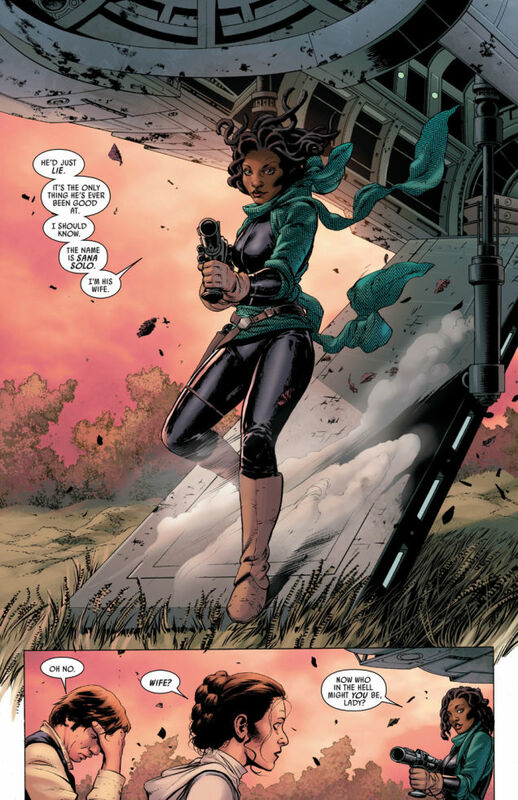 Sana made her debut in 2015 in Marvels Star Wars #6, where she was introduced as Han Solo's long lost wife. Ultimately, it was revealed to be a ruse that Solo and Starros had pulled as part of a scam. Starros has since gone on to become a recurring character in the comics, going on adventures with Han, Luke, Leia, Chewie, C-3PO, and R2-D2. Star Wars: Last Shot is being released as tie-in to the upcoming film Solo: A Star Wars Story, hitting theaters next month. If features a Han and Lando adventure set across multiple eras including before Solo, after Solo, and after Return of the Jedi (another preview released featured Han and an infant Ben Solo). The novel hits shelves on April 17th.